Our work is mainly focused on the attention toward our guests and their personal needs, and our structure offers a series of services aimed to make your holiday or your working trip more comfortable, relaxing and amusing. 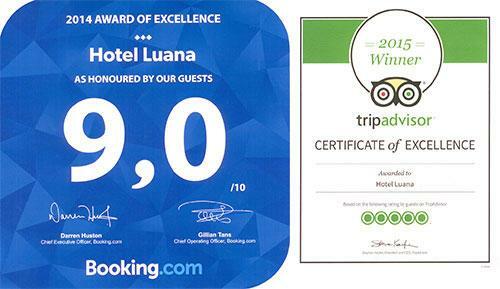 But our services' feather in cap is the “Luana Breakfast”. Every morning you will find a unique, fresh, abundant and delicious breakfast buffet with brioches, jams, bread, different kinds of chees and delicious home-made cakes prepared to satisfy your tastes and habits! Our Hotel will help you to take the most of your holiday in order to enjoy yourself at best. We will help you to organize excursions and guided tours, to rent bikes and motorbikes, besides advise you about the best places for shopping, sport (horseback riding, dance, golf, football, tennis and fishing), culture (Puccini Festival, Carnival of Viareggio, theatres and museums) and for your free evenings in town. Our hotel also signed an agreement with "Bagno Italia" beach establishment (information on request) in order to offer discounts to its guests. Therefore, our hotel is able to offer all that you need for a dreamy holiday, and do not forget that Viareggio is an absolute lively and amusing city!